I didn’t quite recognize the bright yellow wrapper, but when she screamed TUC and I saw the familiar white on blue lettering, I was amazed that something we ate growing up with unfailing regularity that was about as exotic as a potato, made my eyes shine and bad manners show as I lunged for the humble biscuit packet. I couldn’t believe she found this at Safeway! (Where you could also get it in paprika and salt and pepper flavours she said horrified).In my mind’s eye I saw young boys selling TUC at go-slows (aka traffic jams) in Lagos. There was also the time when there was concern that the biscuit had lard and wasn’t halal , but it all was sorted out. And thank god for that! She and another dear old friend whom I hadn’t seen in 17 years came a visiting and while it was not quite Proust’s madeleine, what better way to open the floodgates of memories than feasting on our favourite biscuit. I would like to remind you that you did not open our favorite biscuit packet while we were visiting you. I did, however feast on mine(s) when I got home. I tried the paprika one too (yesterday as a matter of fact). Both original and paprika were consumed in minutes! 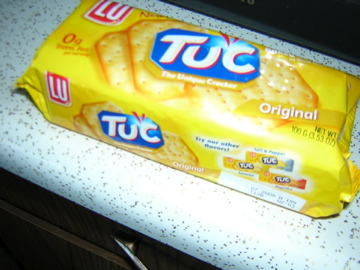 Tuc….sigh, its sure brings back memories of Yester Year :). Makes me wish I had bought a dozen packets when I was there! I love your blog!Your writing is light, witty and a great read. Your description of Tuc in Nigeria made me nosalgic and as a matter of fact I am off to search the Safeway Isles of my fine city for that tasty succulent treat(or a a good substitute). I’m currently feasting on the salt and pepper one myself. Am trying to keep it on a higher shelf so at least I have some exercise while reaching for it every two minutes.